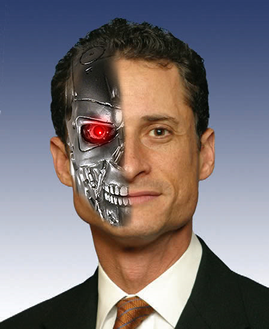 Representative Anthony D. Weiner today took responsibility for hacking his own Twitter account. A desperate 2023 Weiner, his Presidential bid compromised by an even more damning news story that had come out in 2011’s original June, used a classic stainless steel Tesla to return to 2011 and hack his own Twitter account. Only time will tell if the time-bending Twitter hack has been successful at deflecting attention away from the story that will — or would have — ruined his Presidential bid. The revelation that threatened to destroy Future Weiner’s political career is now lost to history, obfuscated by the now-famous “Weinergate”.